Go to the blog to see all 21 pictures in the slideshow. For the most part the photos are self-explanatory. With two exceptions, the photos were taken on June 17, 2013. Two nests were involved, with significant age differences between the two groups of nestlings. Kestrel Team Leader, Don McCartney, provided the following comment on Kestrel chick meals, which sheds light on some of the pictures. 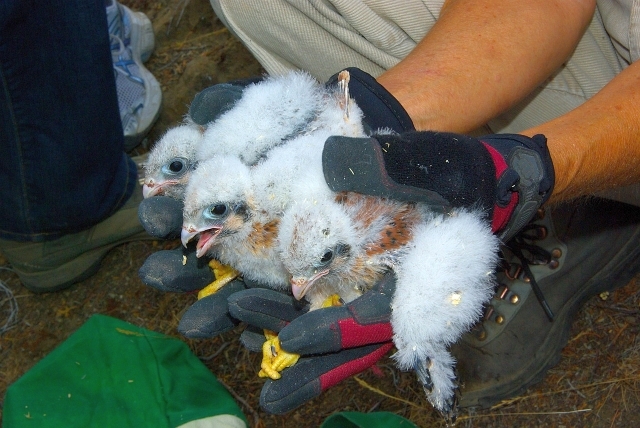 We have documented some of the rather amazing eating habits of nestling Kestrels. One photo, taken in Wisconsin in 2005, shows an approximately 18-day old female slooowly devouring a snake. 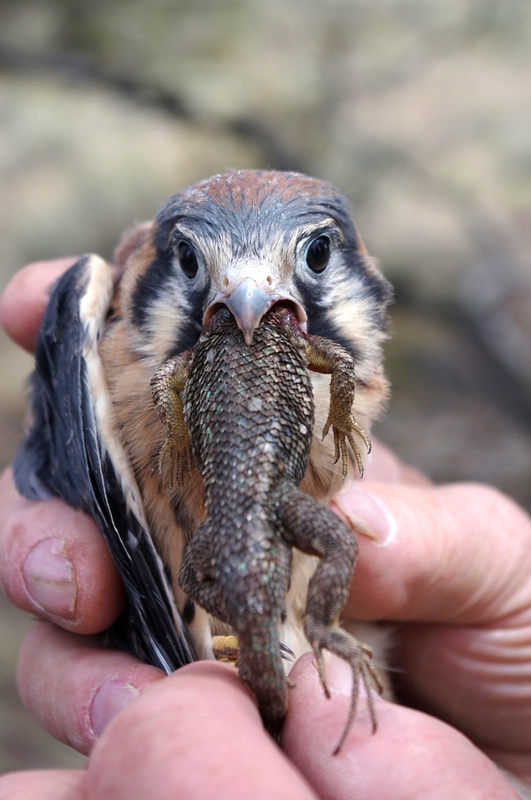 Another photo shows a little glutton on the Crooked River Ranch, who was being retrieved for banding from its nestbox by volunteer Marilynne Keyser. Several photos show close-ups of the bird as it devours a western fence lizard. It’s too bad that we didn’t have the time to check on the progress of the nestling/lizard situation a day or two later. How do they do this? Once the chicks reach a certain size, the adults drop the intact reptile in the box rather than tearing them to pieces. Specialized mouth parts, including the median ridge, keep the prey progressing inward while allowing the nestling to breathe. It is very often interesting to check the remains of prey in the boxes to discover the animals on which the Kestrels have been dining. What a great series of photos. Thank you for sharing their story.